It might be summer, but it's never too early to start planning your next winter escape! Are you looking to actually enjoy the cold and spend some time outside even though its snowing? These five winter playgrounds are the perfect destinations for you! Interlaken is Europe’s winter sport capital! If you don’t ski, don’t worry! Interlaken has something for everyone from paragliding to sledding. If you’re more interested in enjoying fondue and Swiss hot chocolate, Interlaken has the perfect après-ski scene for you. 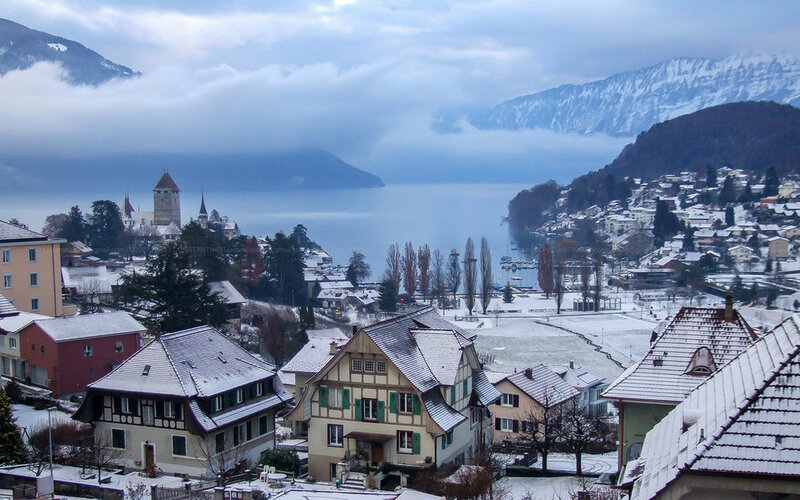 Add in beautiful scenery and Interlaken is pretty much the perfect place to truly enjoy the cold and the snow! Whistler is the perfect place for anyone who wants to get outside and enjoy winter! Obviously, it’s an amazing ski destination, but it also offers so much for non-skiers. The peak to peak gondola means you don’t have to be on skis to reach the mountain top and enjoy the views. Want to take a helicopter to some ice caves, you’re in luck! Last but not least, Whistler has an excellent après-ski scene that even those who relaxed at the spa all day can enjoy! Quebec City transforms into a fairy tale winter wonderland every winter. With frozen canals that you can ice skate on to the largest winter carnival in the world, what isn’t too love? Quebec City is the only place in North America where you can enjoy cocktails in an ice hotel, go skiing, go dog sledding and enjoy Nordic spas. Looking for a quick winter escape? Quebec City is your spot! Chamonix is the perfect destination for a quintessential European ski experience. If you want to enjoy a heavy lunch paired with copious amounts of wine before returning to the slopes, head here! Fondue is everywhere which doesn’t hurt! Not into skiing? Chamonix also has some of the best winter hiking in the world and the town is gorgeous! Newer PostHow To Find the Time!